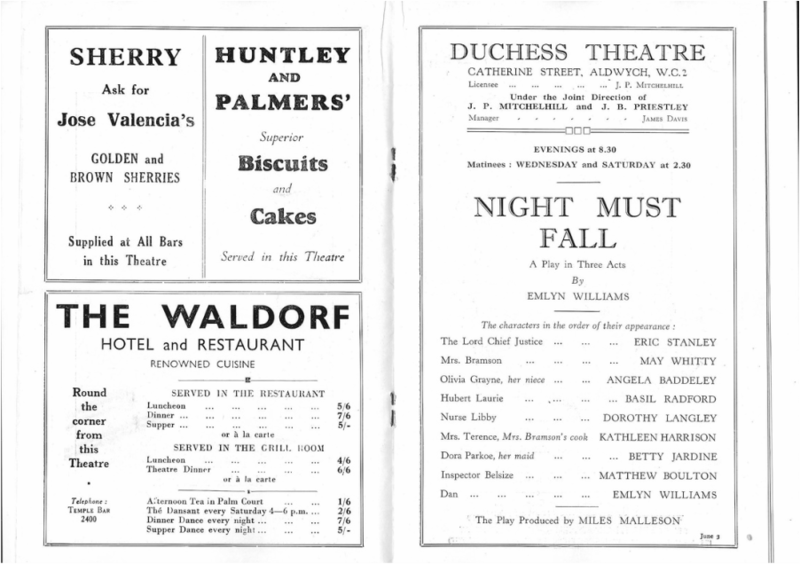 Charles Mortimer played Inspector Belsize in "Night Must Fall", at the Cambridge Theatre, London, from 9 July, 1936, to 9 January, 1937. From The Era of 15 July, 1936. 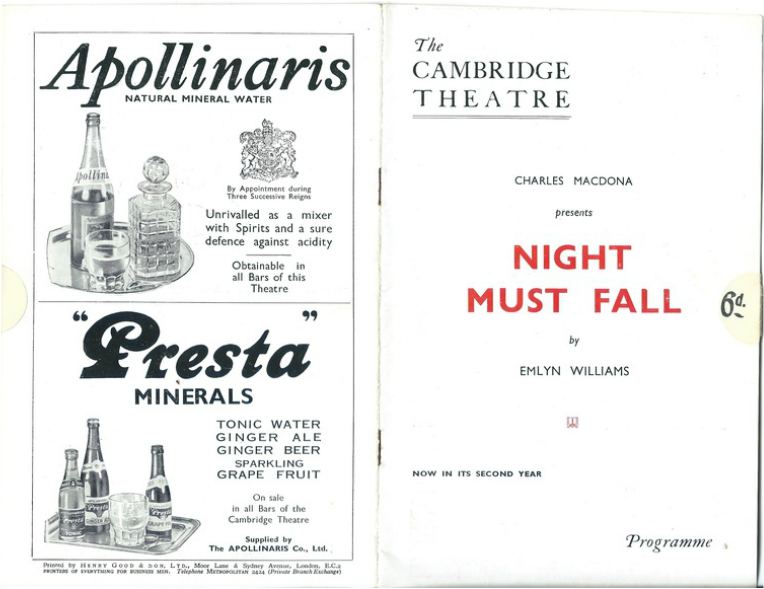 With an entirely new cast, and reproduced by Glen Byam Shaw, Emlyn Williams’s Night Must Fall has begun what should be a successful run at the Cambridge. Esmond Knight is the new Dan (created, of course, by the author), and he plays the difficult and complicated character with extraordinary skill. When I saw him, he had difficulty with Dan's Welsh accent, but, when he partially overcame this, he gave an interesting, moving, and understanding performance. But to be thoroughly satisfactory Mr. Knight will have to acquire a better Welsh accent, a difficult job, perhaps, but within his scope. 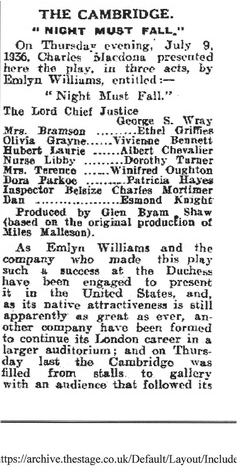 Ethel Griflies gives an impressive character study of cantankerous, selfish, sentimental old age as Mrs, Bramson, and others to be noted are Vivienne Bennett (Olivia), Albert Chevalier (Hubert), Winifred Oughton (Mrs. Terence), Patricia Hayes (Dora, the maid) Charles Mortimer (Belsize), and Dorothy Turner (Nurse Libby). 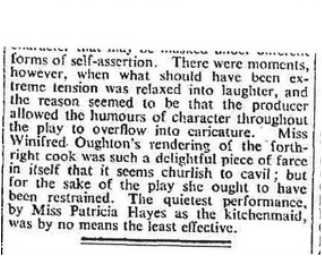 With kind permission of the Times, 10 July, 1936. 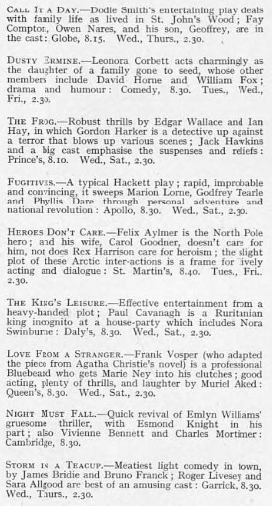 Taken from The Bystander of 8 July, 1936, which highlights some of the other plays in London at the time. 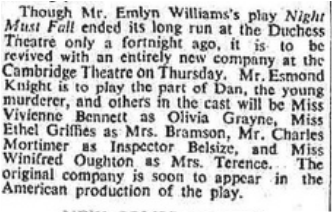 This production moved to New York, and a new cast was formed to perform at the Cambridge Theatre. Charles Mortimer was asked to take the role of Inspector Belsize. 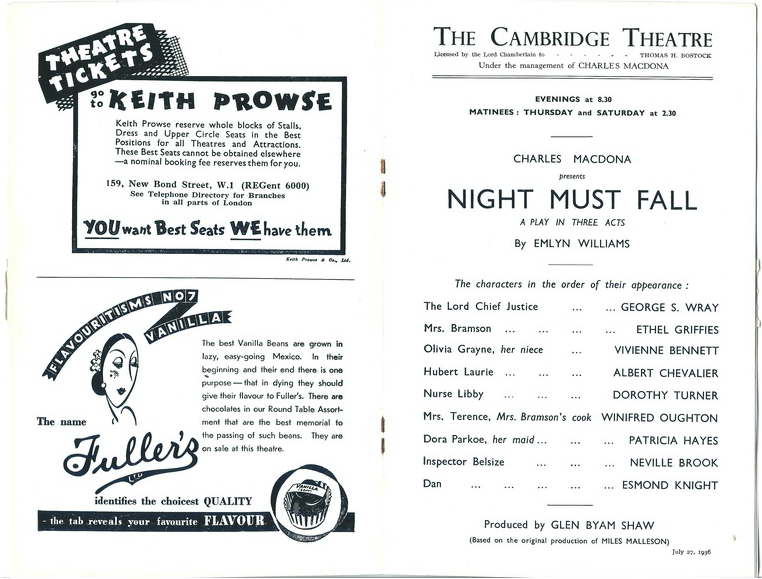 The programme below comes from July, 1936, at the Cambridge, but the cast does not include Charles Mortimer.